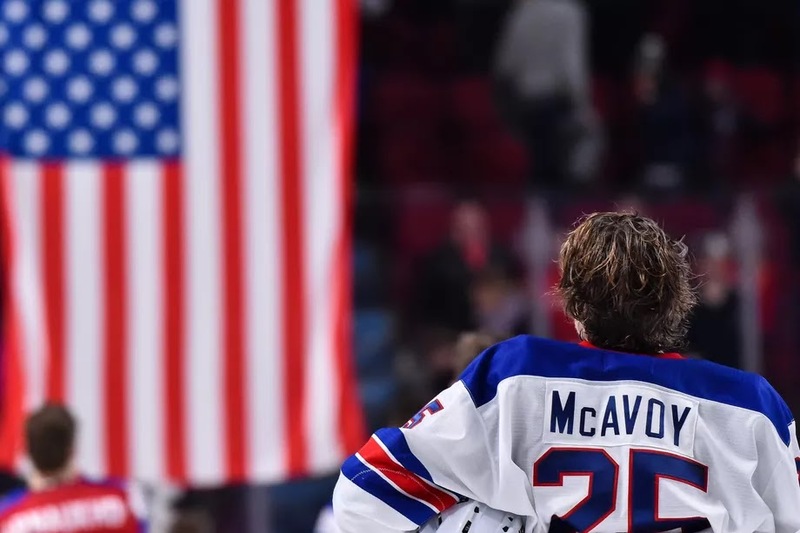 With USA beating Canada for the gold medal at the World Junior Championships last night, there are a lot of amazing stories being told about the team and its players. It was an incredible game with a storyline centering around commitment, resiliency, and a team-first attitude that lifted the squad to their gold medal. During my time as an Assistant Coach at Cornell, I remember watching Charlie play as a younger kid. He skated for the New Jersey Rockets, and he instantly became noticeable on the ice for his play. He was competitive, could really skate, and had an unbelievable head for the game (He had great grades too!). We invited Charlie up to Cornell for a visit to check things out, and it became one of the more memorable visits I had in my time as a coach. During the hours that Charlie and his dad were on campus, I quickly realized that Charlie absolutely oozed character. He was a phenomenal kid, and while getting to know his dad as well, it was easy to see where that goodness came from. We had heard from numerous others that they were incredible people, but upon spending more time with them we understood why so many people had such great things to say. We talked about values and family, we talked about what Charlie wanted out of his future, but the conversation that I will always remember centered around Hurricane Sandy. Prior to his visit, Charlie’s hometown on Long Island got hit really bad by the storm. Stores and homes were decimated, and the town was in really rough shape from what they were saying. But Charlie and his dad spoke passionately about the resiliency of the people there, and the ability for everyone to come together and help each other out in the community. Charlie’s dad himself was a plumber, and spoke about the numerous jobs he was doing for his neighbors for free. It was really incredible to hear their stories. Charlie was an immensely talented player, but there are a lot of immensely talented players out there. We knew that this kid was special and destined for great things because of his character. And what gave us comfort in recruiting this fifteen-year-old kid was the fact that his dad was such a great individual as well. We didn’t decide to fully commit to Charlie because of his hockey playing ability (although that certainly had a huge part in it!). We decided that we needed to have him by the type of person that he was, and the type of family that he came from. Charlie didn’t end up choosing Cornell and wound up going to Boston University. But, I will always be a fan of his. I am not surprised one bit that he became a first round draft pick and a captain of this gold medal winning team. Yes, because of his hockey playing ability. But more importantly because of his character and work ethic. For all you kids out there reading this: if you work hard and strive to be a good person, the probability of good things happening to you will be great. Character shines, and colleges aren’t just recruiting good hockey players…they are recruiting good people just as importantly. For all of the parents out there reading this: What you do and how you act MATTERS. Just as how Charlie Sr. gave us comfort in recruiting Charlie, myself and many of my former colleagues at other schools have chosen not to recruit a kid because of his parents. Your attitude and your actions have consequences for your kids. Encourage them to love the game and work hard, stay out of the youth hockey drama, and for the love of God…Your kid can’t hear you yell from the stands when he is on the ice. Watching Charlie lead the Americans to a gold medal last night brought a smile to my face. It’s awesome watching good things happen to good people. Especially when it involves beating the Canadians.